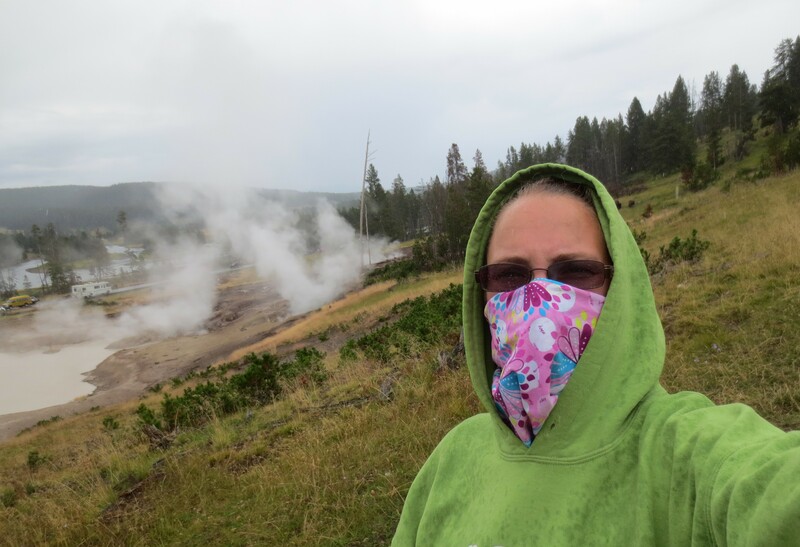 *Yellowstone gets VERY cold at night! The first night there, we were all shivering, even though we were sleeping in sweat pants, socks, t-shirt and hoodie, and were in our sleeping bags. We had to buy warmer sleeping bags for the two boys who slept in the tent. Then, we used their old sleeping bags to add a layer to two people sleeping in the camper. *Despite a cold start to the day, and even a couple rainy starts, it heats up quick in the mountains. We all wore layers that we shed as the day went on. *Groceries are expensive in the park. There are several General Stores that had a decent selection of groceries, but things like meat and cheese for sandwiches, was about double what it is at home. Despite the prices, we had picnic lunches almost every day, so we had to purchase them a few times at park-prices. *A large water jug is a GREAT idea! With the heat, and how much walking we did, we drank a lot! Several places throughout the park have water filling stations. I expected the water to taste like well-water does here, but it was very fresh and clean tasting! We got a 7 gallon water jug that we kept in the back of our vehicle. We filled it up several times throughout the week, which we used to fill our water bottles several times a day. 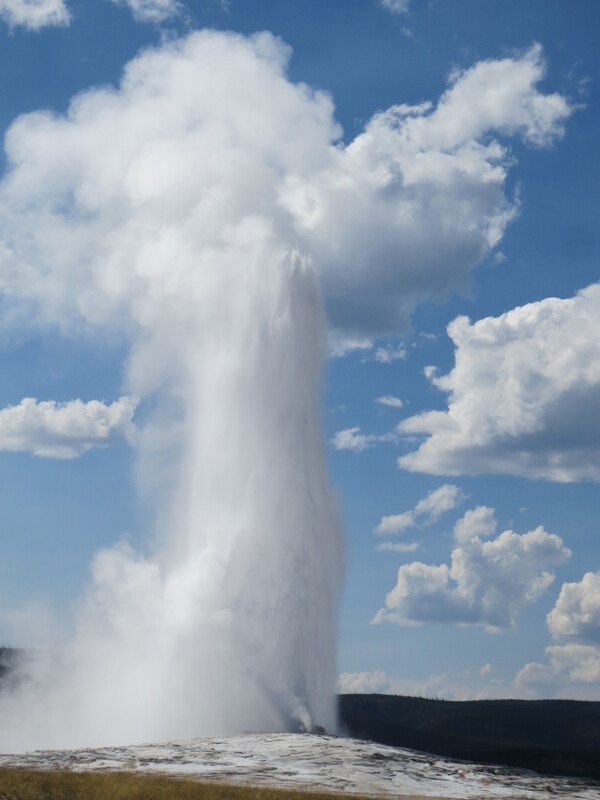 Old Faithful during one of its many eruptions per day. *The food at the cafeteria at Old Faithful Lodge is delicious! Portion sizes are more than most people can eat, and it’s very reasonably priced. We ate there twice – once for dinner, once for lunch. *They take their bear warnings very seriously! Recently, there was a man who was attacked, partially eaten, and cached for future consumption. Several trails were closed. The bear and her two cubs were captured during the course of the time we were out there. She was put down, her two cubs are going to be sent to the Toledo, Ohio zoo. *Don’t take selfies with the buffalo. Recently, a 17 year old girl was trying to get close to a buffalo to take a selfie. The buffalo gored her with his horn. She did not survive. The park’s recommendation is to stay at least 25 yards away from most animals, and 100+ for bears and wolves. *There are a lot of stupid people in the park. 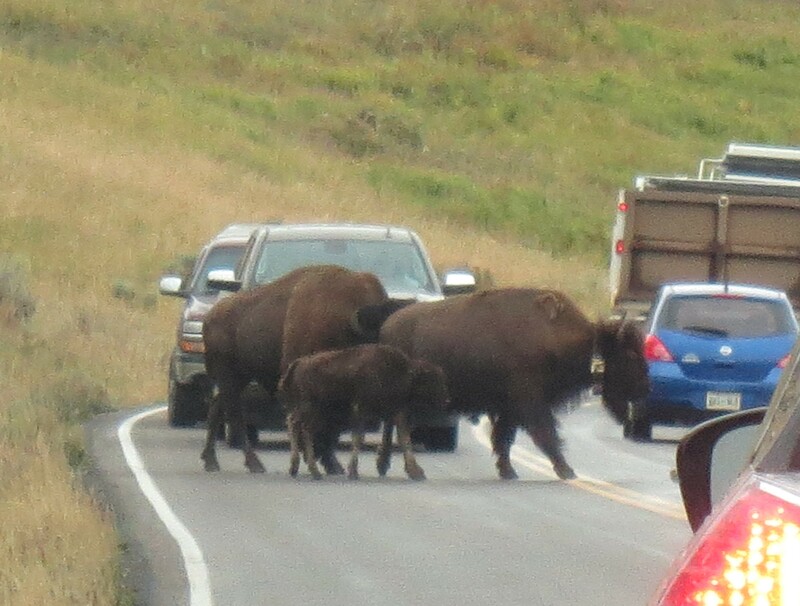 No matter how many warnings there are all over about not getting too close to the wildlife, A LOT of people got out of their cars and were not afraid to get close to the animals, especially buffalo. We saw one man, who was between our car and a buffalo, get too close, and the buffalo stomped towards him to let him know he didn’t like it. I was pretty sure we were going to watch him die right in front of us… our car would have been wrecked too… Whenever we saw people get too close to the animals, we’d say, “Darwinism at its finest…” Most surprising, was how close people let their little kids get!?! *There are a LOT of rules you need to follow in the park. The rules are for the safety of you AND the animals. It’s in your best interest to read the signs (and the rules from the campgrounds), and to follow them. This includes bringing all your food with you (or using the shared bear-proof food boxes available), and throwing your trash in the bear-proof trash bins that can be found all over the park. Another important rule includes staying on the trails. In many areas of the park, the ground surrounding the walkways are thermal. 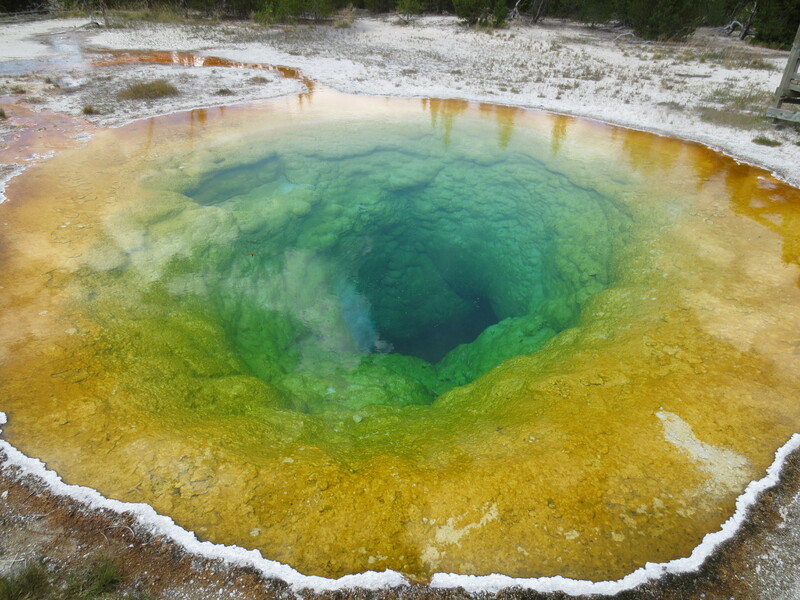 One wrong step could open up a sink hole and/or new hot spring. Other areas are eroding due to extensive foot-traffic. In order to protect the paths and the park, it is a good idea to stay on the path, and not kick the rocks or gravel around. While the bandana did not block all the sulphur smell of the hot springs, it was very helpful! *The hot springs are stinky! I was warned by my Mother-in-Law, thank goodness! I brought a bandana along, and whenever we were checking out stinky springs, I’d put it over my nose. I was glad I did. I heard several people say, “That is one smart woman.” I also heard people say that it was a good idea, and they pull their own bandanas over their noses. *You can’t use mileage to gauge how long it will take you to get anywhere in the park. The speed limit through much of the park is 25 or 35 MPH. You also never know when there might be a buffalo herd, or elk on the road that you need to stop for. You also might want to do some sight-seeing along the way to wherever you are going. I did not expect to see nearly as many buffalo as we saw. Often, traffic was stopped by herds crossing the street. *Use the pull-offs or scenic overlooks. You won’t regret it! There are so many beautiful sights to see in Yellowstone. If you don’t pull over a few times, you will miss them. Many are hidden gems that require a short hike. It sometimes took us an hour or two longer than we expected to get somewhere because we pulled off to see some hot springs or other sights. If you can stay relaxed about your plans, you will really enjoy all the park has to offer. *I’d recommend wearing shoes that are good for walking on uneven terrain. I alternated between tennis shoes and sandals. I still ended up with a blister under my pinky toe, which was not fun to walk on the last day. *Yellowstone has a lot of cool history. Take a few minutes at the various sites to read the plaques that give history of the area, or explain the geological features and how they were made. We learned a lot on this trip just by reading signs! One of the many amazingly colorful hot springs we saw. *Pictures truly do not do this park justice! The mountains, waterfalls, valleys, wildlife, hot springs, geysers… all are so much more beautiful in person. When I saw all the colors of the hot springs in pictures, I thought they must have been enhanced. NOPE! The minerals, bacteria, acids, etc. are so much more colorful than you can even imagine! *The altitude seemed to mess with the tire pressure some. Our gauges on the Traverse were showing some really screwy numbers for the tire pressure. In the end, it was fine…..
*Be prepared to spend some time looking for parking, especially mid-afternoon. We drove around for about 40+ minutes looking for a place to park at Old Faithful. *It’s OK to be over-prepared. We had planned on eating dinners at the campground several evenings. Most nights, we didn’t get back to the campground until after 9, so we ended up eating at the various locations we went to. We had a lot of food/spice items we didn’t end up using, but we would rather have it that way, than not have enough. *A couple things to make sure you have: garbage bags, dish soap, duck tape, ways to charge camera batteries/ phone batteries, lanterns, wet wipes to clean hands when the sanitizer in the rest stops is not enough. *There is no phone signal in most of Yellowstone. We were not quite prepared (mentally) for the fact that not only was there no wifi, there wasn’t even a phone signal. Not a big deal, really, except when you think about all the what-ifs that could happen driving in the mountains, surrounded by wild-life. We all survived just fine! *Finally, we learned that 5 days was not enough. We saw a lot of wonderful things, but we have a list of things we missed that we want to go back and do or see. Even the teenagers want to go back and experience even more of the park! Feel free to add any lessons you learned in Yellowstone National Park in the comments below. * If you are going to do a road trip like this, it’s worth it to buy the seasonal Interagency Park Pass. It costs $80, and gets you into all National Parks, U.S. Forests, etc. for one year. It does not get you into Custer. You can buy a pass that’s good for a week there. With the pass, we didn’t have to pay for admission into the Badlands, Devil’s Tower, Big Horn, Yellowstone, and the Grand Tetons. There are plenty of other places you could use this on, if you were going into the Black Hills, Mt. Rushmore, etc. It’s worth the money. * Many of the different areas have trail guides. They have maps of the many different attractions at each location, such as geysers, hot springs, waterfalls, trails, etc. They also have some information about the sites, and make a great keepsake of the trip. They have a recommended $1 donation at the boxes these are located at. They are very helpful! *There are free guides available at several locations that include maps of the entire area. The two we referred to the most were the “Oh Ranger” Yellowstone National Park guide (it has a green cover with buffalo on it), and the Jackson Hole Traveler, a white book, with a moose drawn on the cover. The Jackson Hole one had maps of the Jackson, WY area, as well as maps of Grand Teton Park and Yellowstone. 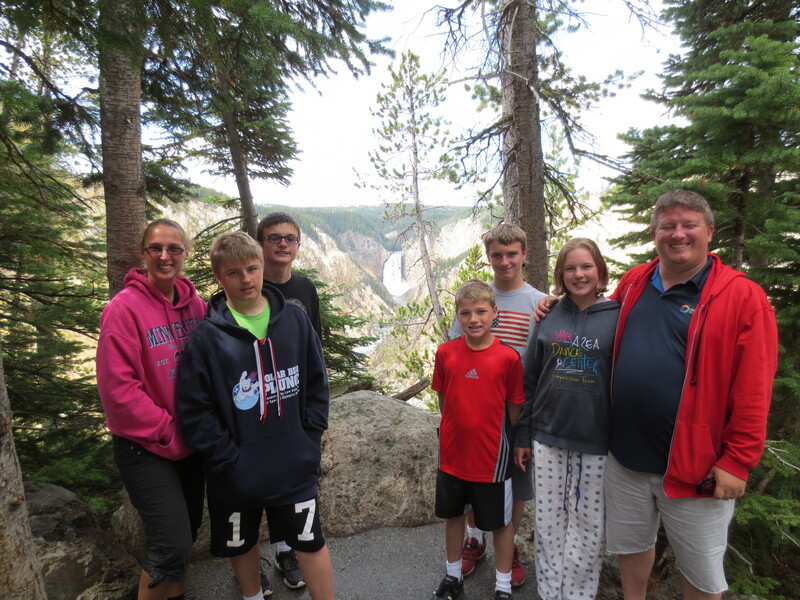 Thank you for sharing your Yellowstone experience. Sounds stressful, but awesome all at the same time. Can’t wait to see more pics! It really wasn’t stressful… if you respect the animals and the park, you will be fine.